As 2010 draws to a close it is fitting I should commemorate another key player in the history of infrared photography, who died 50 years ago: CEK (Kenneth) Mees. Mees had a doctorate in photographic theory from the University of London and was joint managing director of Wratten and Wainwright, who had produced the first commercial panchromatic photographic plates in 1906. Mees had joined the Croydon-based firm in 1906. The father and son team of Frederick Charles Luther Wratten and Sidney Herbert Wratten brought him in as co-owner and joint managing director when they incorporated the company on the elder Wratten's retirement (before that it was a partnership with Henry Wainwright). When George Eastman set up the Kodak research laboratory in Rochester in 1912 he brought Mees over from England to run it. In order to do so he bought the Wratten and Wainwright business. RW Wood wrote to Mees on hearing the news, hoping he had "held 'em up for a king's ransom", asking whether Kodak were going to "close up every plate factory in the world" and hoping that Kodak would now turn out "uniform plates for scientific work". Mees wrote back to reassure Wood, saying that "we shall be able to make even better plates for scientific research than we can make at Croydon". It is possible that Wood and Mees were acquainted by letter before Wood's European sabbatical in 1910-11, but they clearly became friends and corresponded until at least the early 1950s. In 1910 Mees was an ordinary member of the council of the Royal Photographic Society, and he chaired the Traill-Taylor lecture meeting where Wood presented his Invisible Rays paper. Wood's contact address was listed as c/o Wratten and Wainwright in the RPS exhibition catalogue and it would have been Mees who provided Wood with the infrared-sensitive plates he used on his Italian travels in 1911. Mees also made use of infrared-sensitive plates himself. The Kodak Research Laboratory archive at the University of Rochester contains thirteen photographs (negatives and prints) taken in Portugal in 1910 by Mees using Wratten and Wainwright infrared sensitised plates (one of which was included in the Infrared 100 Exhibition). The images were taken through a Wratten 88 red filter with five-minute exposures and some show the characteristic dark skies and bright foliage that we now recognise in infrared photographs. However, in his 1936 book 'Photography' Mees credits Wood with taking the "earliest photographs of landscapes by infra-red rays", presumably referring to the images from Wood's 1910 publications. I won't go into further biographical details on Mees as I can point you to two good sources. One is from the Croydon Camera Club, of which he was a member (explore the Who is Dr Mees item in the menu), and the other is the Image, the bulletin of George Eastman House. Mees did indeed provide facilities to Mannes and his colleague Leopold Godowsky Jr to work on their colour process, which eventually became known as Kodachrome. This iconic slide film was discontinued last year and the last-remaining development facility closes its doors today, at the end of 2010. So it goes. Via last week's New Scientist magazine I came across an interesting announcement from Idaho National Laboratory, which is part of the US Department of Energy. Researchers there, at Microcontinuum in Cambridge (Mass) and Patrick Pinhero of the University of Missouri have been working on an alternative way of gathering solar energy using minute antennas rather than solar cells. They have produced an array of what they call nanoantennas which are tuned to infrared radiation and, as antennas do, resonate and pass the energy into electrical circuits. So far they have a six-inch circular 'stamp' that can emboss a plastic substrate which can then be coated with metal. The six-inch stamp can produce an array of ten million antennas. So far they are only able to produce arrays small enough to match infrared wavelengths but they plan to go finer and so reach visible wavelengths. One problem is how to handle the energy from the resonating antennas, since this is at light-like frequencies (a few hundred teraHerz) and rather beyond your average radio set! Why is this of interest to us? Let's follow this through logically and refer to that six-inch stamp as a ten megapixel array and you see what I'm thinking. Could a tuned array of nanoantennas be an alternative way of making an image sensor? Ironically it is easier to make such an array for far infrared wavelengths than for visible light; so this might be a way of producing an inexpensive thermal imaging sensor. The down side is that (I assume) the energy arrays collect energy in serial or parallel and don't give access to individual 'pixel' antennas. For thermal wavelengths there is also the problem of ambient radiation: this is something they wish to capture for a solar array but it would contaminate an image. However, hopefully the former is a question of nano-engineering and the latter is already a problem with some existing kinds of thermal camera so we know how to address it (by cooling the sensor). Using antennas for imaging has some advantages. To filter wavelengths you simply adjust the size of the antenna to match whichever wavelength you wish to receive. It might even be possible to do this dynamically. 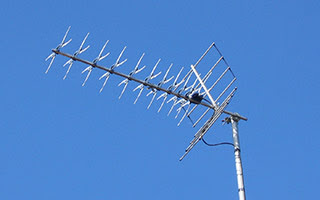 The antennas may be inherently polarised as well, which would have interesting applications. They might even be more efficient in harvesting the light energy since the researchers estimate the efficiency as being close to 80% and perhaps you could even make miniature Yagis for more gain. And the cost? "As cheap as inexpensive carpet" says the report. The INL report is actually from 2008 although New Scientist reported some more recent developments. For over 150 years we have relied on energetic photons changing chemical or electronic structures for our imaging: the idea of tuning in to the energy directly is an interesting alternative. Perhaps the biggest barrier to use as an imaging sensor is scale. Don't forget that ten megapixel array was six inches across. It'd be ironic if a large format view camera was needed to use it. As snow falls here in southern England for the second time this December I thought it appropriate to say a little about the Wood Effect. Named after Prof RW Wood, this is the brightening of foliage seen in infrared photographs that can often look like snow, first seen in his photographs from 1910. The phenomenon had been observed before Wood, but not in an image, by Ogden Nicholas Rood, professor of physics at Columbia University, in his book on colour published in 1890 (or earlier). However this was based on spectrographic measurement of 'green' leaves and not photographic observation. Willstatter and Stoll produced their theory of leaf reflectance in 1918 in their book Untersuchunger aber die Assimilation der Kohlenseture published in Berlin, and much of the literature on this was published in Germany. Not much is freely available on the web, although Mecke and Baldwin wrote about leaf reflectance in infrared in a 1937 paper which is available as a PDF (from Die Natlirwissenschaften in German). Basically, the W-S theory says that light is reflected around within the internal structure of a leaf. Some eventually passes through and some is reflected back. Near infrared is not attenuated by the chlorophylls in the leaf as they are transparent at these wavelengths. The physical structure of the leaf is similar to that of snow, which is why infrared photographs can often look like snowy scenes. Unhealthy or dead leaves do not reflect so much because of changes in the internal structure, so the amount of infrared reflected by foliage can be used as an indicator of plant health. The W-S model can be easily improved, however, by introduction of more intercellular air spaces. The modified W-S model promises to be an excellent representation of physical reality. Accurate predictions, however, require an inordinate amount of computer time. biochemical absorptions are limited to the compounds typically found in dry leaves, primarily cellulose, lignin and other structural carbohydrates. However, foliar reflection in this region is also affected by multiple scattering of photons within the leaf, related to the internal structure, fraction of air spaces, and air-water interfaces that refract light within leaves. They don't call this the Wood Effect because, like most of the earlier papers I mention, they consider the optical properties across more wavelengths than infrared. However Mecke and Baldwin refer to the brightening of foliage in infrared as the Chlorophylleffekt. So where is the earliest reference to this as the Wood Effect? Strangely, this also seems to be in a German publication, in an article by someone named Marmet in a journal called Photofreund, (reference 18: 289-90, No. 15, August, 1938). I have seen this cited in a literature list produced by Kodak at the time, but not the original article itself. Infrared photography declining in popularity? Google's Web Trends is an interesting facility. It tracks the traffic for search terms and can give you an indication of something's popularity. Here's the result for Infrared Photography. Nothing of any use before 2007 but a slight decline since the end of 2006. But why the spikes in interest in October 2007 and January 2010? The spike in January was just before Phil Coomes ran a story about the centenary on the BBC web site. You'll notice that there's most interest in the far east: Philippines, Singapore and Indonesia as top three regions. USA is 6th and the UK is 10th below Australia, NZ and Canada. I'm not sure what all this really means but it's curious nonetheless. The graph of news items shows a dramatic peak around August 2008. Again ... why might that be? The Google graph is showing a slow declining trend. Is that because less people are interested in infrared photography or could it be that those people who used to ask how to do it now know and don't need to look it up any more. Or maybe it means nothing. Oh, and while you're at it, try 'Lady Gaga' as a search term. Elliott Landy is the man who took that iconic colour infrared shot of Bob Dylan and was the official photographer at the Woodstock festival. Those of you who made it to the Infrared 100 exhibition in Bath will have seen a large print of his bobness, perched on the boot of a car and surrounded by bright red foliage. This photo, and others ... including more of Elliott's 60s infrared photography ... will be on show in Montreal until Christmas Eve. The exhibition is called Elliott Landy, Spirit of a Generation and it's at Galerie Lounge TD in the Maison du Festival Rio Tinto Alcan, 305 Sainte Catherine Street West. Entrance is free. More in this story from the Montreal Gazette and at Galerie Lounge. This second includes a video interview (in English). Also, the Center for Graphics in Echirolles, near Grenoble in France has an exhibition of Elliott's 60s photos. This runs until January 30th. This also includes infrareds and there is more info en français on the Graphisme Echirolles web site. 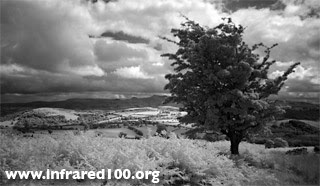 I've been counting 1910 as the year in which infrared photography started, triggered by RW Wood's articles published in the Century Magazine and Photographic Journal. So we are approaching the end of 2010 as a centenary year ... but is that the end of this blog? Obviously I'm going to say "No! It's not." Partly this is because May 2011 is the centenary of a paper Wood presented at the Royal Institution on his invisible rays work and the end of his European sabbatical, but also this is a good place for infrared photography snippets and pointers. So, let's carry on shall we? Your contributions, questions and comments will all be gratefully received. Here's to Infrared 101 and beyond.